Fresh off back to back losses to the ticats over Labour Day, the Argos sit at 3-8 on the season. 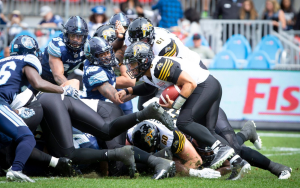 With Jeff Mathews under centre, the Argos look to continue roll against the eastern conference. Can they do it? Jube will get you ready. Are you ready for the Willy Era? QB Drew Willy is scheduled to make his first start for the Argos in Week 15 against the Als. Monday Night Football North of the border? Let’s do this! Montreal makes their first visit to the Argos new stomping grounds with both teams having plenty to prove. Here’s what you need to know in about seven minutes. Friday night in Hamilton this week means more than firing up the fart can on your Civic. It’s the Argos Pink Game!